Consumers grumble about rising gas prices. The price of goods – inputs, outputs, intermediates – escalates; businesses struggle. As the price of oil steadily climbs to an all-time high and U.S. currency, markets, and overall economy are left to suffer in its wake. You think it’s bad now? The situation may be getting worse. In addition to being the backbone of the global economy, oil is a non-renewable commodity whose demand curve has increased steadily over the past two decades. The problem? The world may not have enough oil to go around. Will we completely run out of oil? Not likely. Many have dismissed the idea that the global community could ever completely deplete the world’s oil supply. However, it’s not extracting that last drop of oil that will send the world into its biggest energy crisis in history. Not even close. The true turning point occurs when the gap between the demand for oil and its accessible supply becomes so great that the resulting price brings the world economy to a grinding halt. Unlike previous energy shocks of past decades, this unprecedented energy crisis is based on accelerating global demand, rather than sudden, short-term interruptions of supply. The result? “A long period of significant hardship worldwide.” . While higher oil prices will stimulate the development of additional oilfields, the remaining oil is difficult to produce, expensive to extract and refine, and is owned by a small majority of the world that seems to hate everyone else – or, at least, the U.S. Moreover, while new production may slow the decline in production, it cannot completely prevent it. What about ‘alternative energy’? Some alternatives, like natural gas, have showed promise, but it too is a limited-supply fossil fuel. Further, all of the current ‘viable’ sources of alternative energy (e.g., wind, solar, biofuels, biomass, hydrogen, and even nuclear) are extracted, collected, generated, or otherwise based, in whole or in part, on oil and oil-based fuels. In addition, not one alternative energy technology is currently suitable for wide-spread commercial implementation. Even if the technologies themselves were ready to be implemented, the necessary infrastructures are primitive, if present. Implementing alternative energy sources is, at best, daunting: it requires massive short- and intermediate-term investment and represents a massive drain on the dwindling pool of global capital. The global shift to alternative energy sources is inevitable. The challenge, then, is to execute the transition seamlessly and efficiently by appropriately allocating capital to winning sustainable alternative technologies thereby permitting the global economy to maintain reasonable growth levels. On the other hand, inefficient execution of this crucial transition will almost certainly result in a severe depletion of global capital, leaving little or no financial resources for investment in other areas of the world economy. Jessica, your posting is very impressive. I agree an impressive posting! This is not a problem for our children’s children, it is a challenge that we will confront in the near future. Whether you subscribe to the Peak Oil Theory or not, it is hard to argue with the fact that demand, due to the unquenchable thirst for oil in the developed countries coupled with the growing need for oil in the world’s emerging economies, is beginning to outstrip supply. As the blog post points out, demand in the long run will continue to grow driving prices ever higher. The increase in the cost of a barrel of oil in the past year has happened so suddenly and dramatically it has resulted in a shock to which the free market system has had little time to adjust. While the shift to alternative energy sources is most likely inevitable, future sources of energy will probably be dramatically different. Innovation has been a hallmark of the free market system in the past, and I suspect that it will continue be so in the future. The increase in the cost of energy not only creates problems but it also opens the door to opportunity. As in the past, entrepreneurs will rise to the occasion as it becomes profitable to do so. They will compete to make current alternative sources of energy more efficient and they will develop new sources of energy as it becomes increasingly profitable to explore this area of commercial endeavor. I suspect that there are many chapters yet to be written in the story of our impending energy crisis. You mention a very valid point that I feel will help us through the impending energy crisis that was so appropriately described by Jessica’s excellent entry. Innovation has driven mankind from the days of old to invent devices out of necessity. Even during the Stone Age, tools were invented to make life manageable and to address a need of the current time. Human spirit will not stand idly by while the economy and the world around us are thrown into a tailspin of which we cannot recover from. The need for knowledge and necessity drives us to create remarkable inventions. While many of the recent innovations in renewable energy are years from taking off on a grand scale, small wins along the way allow us to change the process and accelerate the pace at which we apply the technology. Take, for instance, the market of solar panels. While it has long been argued that the cost of solar panels does not match the equivalent cost of producing electricity from coal fired plants, recent innovations in solar cell technology have significantly dropped the cost of solar power by 25% (http://www.technologyreview.com/Energy/21255/). Who is to say that the panels don’t become so efficient that we are able to have them installed on the hoods of our cars to recharge vehicle batteries as we travel down the road? I’m reminded of a paper written by Leon Chua in 1971 regarding the relationship of the fundamental circuit elements (resistor, inductor, and capacitor) and their relationship between current, voltage, charge, and flux. Mr. Chua theorized that a fourth element existed which was not yet known to the scientific community. It took 37 years before a researcher at HP labs discovered the memristor that Mr. Chua hypothesized existed. It is revolutionary ideas such as these discoveries that can and will shape the evolution of our current energy situation. Nice work on the article. It is amazing the level of press that the topic of energy and oil have demanded over the last year. The coming election has furthered the argument and may result in perfect timing. The American people, regardless of political affilliation are ready for an answer. Even “Big Oil” successes of the past like T. Boone Pickens have adopted plans to reduce the the United States dependence on foreign oil. http://www.pickensplan.com/theplan/ The timing of the election demands answers from each of the candidates. This pressure and increased awareness makes facing the issue head-on one of the keys to the next presidential term. My second comment concerns the ratio between crude oil prices and gasoline (Price per barrel/Gallon of gasoline). From 1997 to 2005, the price/barrel of crude oil maintained a ratio between 10/1 and 20/1. Throughout the last three years this relationship has climbed significantly. In fact, at the beginning of August the ratio was 30.57. This speaks to the fact that even as the price/barrel of oil declines, historical ratios imply that the price per gallon of gasoline will not fall as much. It also supports current gas prices remaining relatively stable while the price/barrel of oil fall significantly. 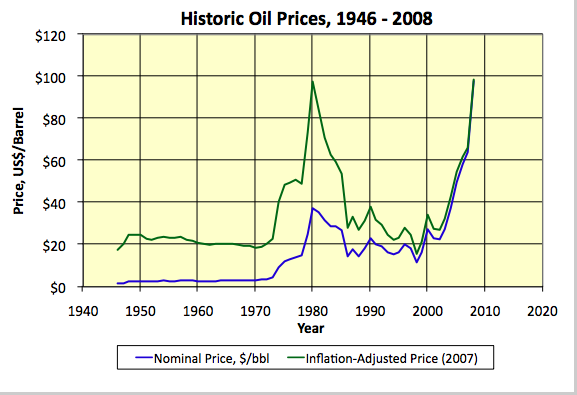 http://eidelblog.blogspot.com/2008/08/truth-about-oil-versus-gasoline-prices.html. From my own experience, the market has shown that price increases are heavily intact. Firms across the world have realized considerable increases in cost. This speaks to the dependence we currently have on foreign oil and our inability to generate alternative forms of energy. I agree with Joshy that we are a resilient and intelligent nation and when pushed into crisis we respond well with technology and innovation. The recessionary pattern of the economy, political change based on reform and an informed and concerned American people will help restore the prominence of the U.S. through this energy crisis. It is possible that what is happening is that the time delay to get new product on line is longer than the response time expected. We read repeatedly about the lack of pipe, the lack of drill rigs, the lack of experienced engineers, etc. Also it is probably true that the oil companies were fearful of investing, expecting a market correction (recession?) as the banking/real estate bubble has imploded. What we may be experiencing is what Robert Rapier calls Peak Oil Lite with the early effects of Peak Oil arriving. Demand is rising faster than supply. In its July 2007 report the International Energy Agency predicts OPEC spare capacity will decline to minimal levels by 2012. The lack of spare capacity means, that price volatility increases with price spikes occurring in the event of supply disruption. In 1986, China consumed 2 million barrels of oil per day (com pared with about 16 million barrels per day in the United States at the time.) By 2006, China was consuming more than 7.4 million barrels per day, according to the U.S. and rising. In April 2008, reported that China’s oil consumption had jumped another 2.5% over a year earlier. In India, oil consumption has risen from just over 1 million barrels per day in 1990 to 2.63 million barrels per day today. And let’s not forget the United States, which consumes more than a quarter of the world’s combined energy products. Energy demand is growing there, too, despite an economic slowdown in 2008, to 20.63 million barrels of oil per day in April 2008, compared with 19.6 million barrels per day in 2000. In a transition from oil to elelctricity wee need to understand that all fossil fuels not only oil but in addition to that also coal ultimately needs to be replaced. If the U.S. will need some 750 new nuclear plants to replace all oil used in that country when then ultimately the need to increase that number by an additional number of nucleaer plants also to be able to replace the expected quite steep reduction of coal awailability as times goes buy.The U.S. has already passed its peak of production for high-quality coal and has seen production of bituminous coal decline since 1990. Already China has shifted from being a minor coal exporter to being a net coal importer. That has this summer given as a direct result that the price for coal as well as electricity has increased significantely. The notion that we’ll see cheaper coal in the future simply most likely is a very false one. Krishna brought up an excellent point stating that the U.S. would need 750 nuclear plants to replace all the oil used in the country. However, it has been 25 years since a nuclear power plant has been built in the U.S. The government is at least trying to jumpstart the possibility of new nuclear power plant with their “Nuclear Power 2010” initiative. [http://http://www.ne.doe.gov/np2010/nenp2010a.html]. Also, in regard to wind and solar energy, congress still has not extended the renewable energy production tax credit. It is set to expire at the end of the year, and without it we could see a significant drop in the level of investment in these alternative energy sources. Jessica your blog is very informative and thought provoking, well done. This posting definitely gives us a glimpse of how oil prices will continue if events remain unchanged. To avoid these issues and the economic repercussions that would follow these issues the US needs to diversify its power infrastructure away from fossil fuels. As for the options that my fellow commenter’s have posted the two that seem to be a reoccurring theme is that of nuclear and wind power. Between the two I believe that nuclear has the greatest potential and the lower overall economic cost. Nuclear reactors use uranium isotopes as fuel to generate electricity and these fuels have become less expensive in recent years due to new methods of mineral exploration and exploitation. [http://www.world-nuclear.org/info/inf75.html] In fact due to this reduction in uranium prices the overall economic cost of nuclear energy is much less then what we are currently paying for coal or oil based electricity. [http://www.world-nuclear.org/info/inf02.html]. As for the feasibility of wind generated electricity there is a major efficiency issue that needs to be overcome. The fact is for wind to be able to supply electricity on the magnitude that coal, oil and gas do you would need 70 thousand 3mw wind generators. (By my own figures) [http://www.eia.doe.gov/cneaf/electricity/epm/tablees1a.html]. While constructing 750 nuclear power plants may be expensive and time consuming, constructing 70,000 wind generators would be more so. Although to play the devil’s advocate against my own opinions there is no hazardous waste associated with wind power. On the lines of alternative energy, the United States is way behind in infrastructure to see any benefits from wind energy. Billions of dollars must be invested in power lines to make alternative energy feasible. The question becomes where does this money come from? Do we expect private industries to come in and provide these needs and subsequently pass the costs off to consumers, or should government get involved and subsidies energy companies to get us to where we need to be. Either way the consumer will be hit with higher costs associated with building new infrastructure. Couple these costs with the increasing price of energy and the new movement toward renewable energy, which will also cost more, the future looks bleak for any energy price relief. We need a comprehensive plan to attack first, the short term rise in energy costs, and second the long run decrease in supply and increase in demand. Focusing on the short term, in order to lower costs we must consider coal as an option. One quarter of the world’s coal reserves are found inside the United States, and the energy content of the nation’s coal resources exceeds that of all the world’s known recoverable oil (http://www.energy.gov/energysources/print/coal.htm). This is a resource we cannot ignore and new technologies have made coal generation much cleaner. Production of new coal plants have been blocked recently because they are not up to environmental standards. If the U.S. Consumer is willing to pay considerably higher prices then renewable forms of energy are a good option, but my guess is they are not ready. Coal generation can be used as a bridge to low cost, efficient renewable energy. A book you might want to read is The Bottomless Well, subtitled: The Twilight of Fuel, the Virtue of Waste, and Why We Will Never Run Out of Energy by Peter Huber and Mark Mills, Basic Books (2005). training. People enjoy looking at what other people have written concerning your goods. Thinking Long Term About the Equity Premium Will the Credit Crunch and Housing Bust Trigger a Deep Recession?